Ethan Miller/Getty ImagesLonzo Ball is just the latest athlete to have to cover up his ink as part of the NBA’s crackdown on rules regarding the promotion of brands. Lakers guard Lonzo Ball played with a bandage on his right arm through the team’s preseason game against the Warriors on Wednesday. Ball wasn’t injured, but instead was covering up his Big Baller Brand tattoo due to NBA rules about players promoting brands on the court. Ball isn’t the first player to have an issue with branded tattoos this year, with J.R. Smith raising a similar issue earlier this month. When the Los Angeles Lakers faced off against the Golden State Warriors in a preseason tune-up on Wednesday, Lonzo Ball took to the court with a bandage of some sort on his right arm. 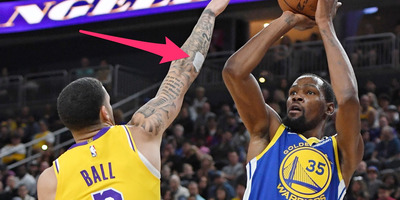 Ball’s bandage wasn’t due to any sort of injury, but rather a strategically placed cover-up to conceal his tattoo of his family’s Big Baller Brand “BBB” logo. Ball got crafty with the bandage (or possibly just a piece of athletic tape, it’s tough to tell), to avoid a fine from the NBA, as the league has made it clear they will not allow the promotion of non-partner brands on the court. 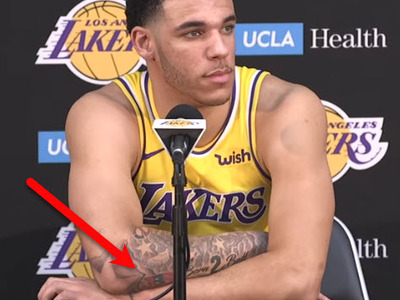 YouTube/LakersLonzo Ball’s uncovered Big Baller Brand tattoo. You can see the uncovered tattoo on Ball’s arm during his media day appearance at right. News of the rule first made the rounds ahead of this season due to J.R. Smith, whose new tattoo of the Supreme logo raised concerns from the league, prompting the NBA to contact Smith and inform him that he would be fined for every game he played with the logo visible. It’s an issue that has come up, however sparingly in the past – Smith’s former teammate Iman Shumpert was once forced to remove an Adidas logo that he had shaved into his high-top fade. We still don’t know how the matter will play out through the season, but for now, it looks as though Ball is alright for the moment with covering up for game days. Ball and the Los Angeles Lakers open their 2018-19 season on October 18 against the Portland Trail Blazers.